Josh Weinstein grew up in Washington, D.C. where he attended St. Albans High School. There, with his best friend Bill Oakley, he founded the school’s shortlived and nearly banned humor magazine. He went on to Stanford University, where he was Editor-In-Chief of the university’s humor magazine, the Chaparral. After a brief stint in advertising (basically, writing classified ads), he rejoined with Oakley and worked on a number of projects before landing a gig at The Simpsons. Working there for nearly eight years, they worked their way up from Story Editors to Showrunners, running the series for its acclaimed 7th & 8th seasons, as well as penning such memorable episodes as “Who Shot Mr. Burns”. After that, they created the shortlived but cult favorite animated show Mission Hill. On his own, Weinstein wrote for Futurama for its entire Comedy Central revival and, along with the other producers, won an Emmy for it in 2011. 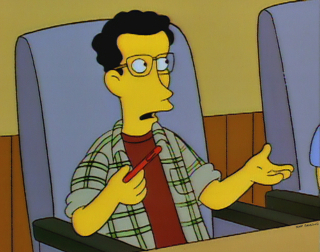 He has also won three other Emmys for The Simpsons, a Peabody Award for The Simpsons and was nominated for his writing a Futurama episode for a Writers’ Guild Award. Most recently, Weinstein has served as Showrunner for CBBC’s award winning and innovative animated show Strange Hill High (made in Manchester) as well as a writer for Disney’s Gravity Falls, co-writing a large number of episodes for the series 2nd season, including the recent “Weirdmageddon” episode. He has also written an upcoming episode of Danger Mouse. Though he lives in Los Angeles, he wishes every day he could move to Manchester. This is not an exaggeration.